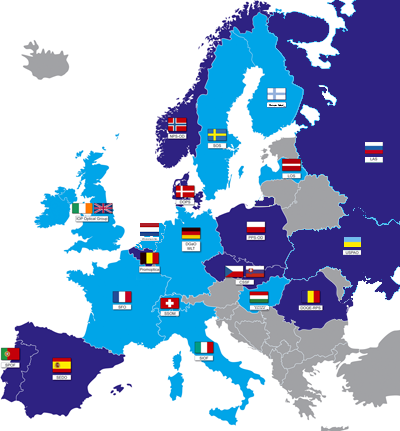 Before 1984, optics in Europe was represented by the European Optical Committee (EOC). In May 1984 the EOC joined the European Physical Society (EPS) to create its Optics Division. In 1986, the National optical societies of several European countries founded Europtica (the European Federation for Applied Optics), which was officially registered in Paris in 1987. In December 1986, a Memorandum of Understanding (MOU) was signed between EPS (the legal representative of the Optics Division), Europtica, and SPIE, in which the three parties agreed to organize jointly one major annual optics meeting in Europe. This MOU initiated the ECO series of meetings, which were managed by the French organisation Europtica Services International Communications. The experience with these conferences demonstrated the need for a lean and efficient organisation of optical activities in Europe. Thus, in March 1990 the Board of the Optics Division unanimously voted for starting negotiations with Europtica in order to found the European Optical Society (EOS). The EOS was founded on 24 May 1991. The purpose of the society is to contribute to progress in optics and related sciences, and to promote their applications at the European and international levels, by bringing together individuals and legal entities involved in these disciplines and their applications. The European Optical Society (EOS) serves as the joint forum for all individuals, companies, organisations, educational institutions, and learned and professional societies, who recognise the opportunity and challenge that a common European base provides for the development of optics in its broadest sense.